Hoping you have good holiday season. Thank you for visiting to AAPF and supporting always in 2008. Let me wish you and yours a happy and healthy New Year, and enjoy AAPF continuously. On 26 December, Tomy have announced to combine subsidiary companies, Yujin (capsule toys), Subarudo (candy toys), Heartland (plush doll), U-mate (stationery/water toys). New company name is 'Takara Tomy Arts', will operate from 5 January 2009. Yujin will release Zukan (3D Pokedex) Series DP11, 5 capsule sets in the end of April 2009. Will upload the photo later. As for previous Zukan series, please refer to Yujin 3D Zukan articles. Bandai will release Pokemon Kids Kimewaza : Attacks Learned (also known as Move) DP series 2 in the end of March 2009. Will upload the photo later. As for previous 'Attacks learned' items, please refer to series 07, 08 and DP. Banpresto will release the following game prize DX plushies in 3rd week of April 2009, Size : 24cm. It's notched Ear Pichu's first merch. In 4th week of April, Pikachu and Raichu (same as these) will be re-released. The photos of figures release in January 2009 are uploading to previous article. 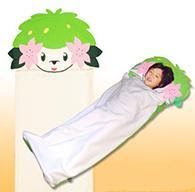 MediaFactory releases Shaymin Sleeping Bag in the end of November. Size : 160cm x 60cm, Weight : 700g, Material : fleece. This item is available at Toysrus and PokemonCenter only. Yujin will release Pokemon Dial Ring (function : wire lock) in the end of February. Size : 4.5cm, gashapon (capsule toy), wire color : black or red, 3 kind of design. 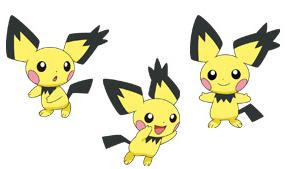 Pichu is same as before one, not notched ear Pichu. Will replace the photo later. Bandai will release the following 10 figures as Super Get Platinum World 05 in the beginning of March. All 10 figures has platinum color version. Giratina (origin) and Shaymin (sky) will be new posing. Will upload the photo later. If want to check previous items, please refer to BandaSG. Pokemon 151 official site (T Shirts Project) is going to close on 31 December 2008. After closing official site, T Shirts is going on buying at each Pokemon Center. Bandai will release the following 5 figures in Febraury 2009. Will upload the photo later. If want to check previous DX items, please refer to DX 1, DX2 and DX3. Wallpaper and December's calendar for PC (Win/Mac) of Pokemon movie 12th 超克の時空へ/To the Conquering of Space-Time is available in the movie official site. BTW, AAPF checked Corocoro's January magazine (released totday), but nothing new info. Will post relational page later. One day ahead, movie 12th official site has opened and title/poster are announced in PokemonJP site. 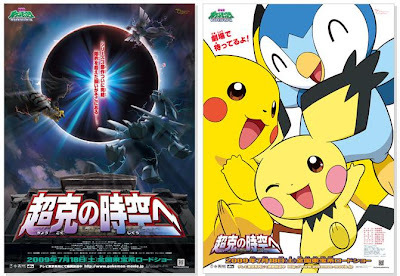 Movie title 超克の時空へ in Japanese, English title is To the Conquering of Space-Time (from Pokebeach.com translation) as mentioned yesterday article, new Pichu info is uploading officially. 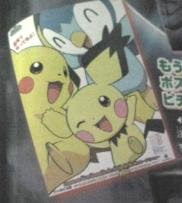 As for new Pichu, it is female, name is キザみみピチュウ in Japanese, meaning notched ear Pichu. Not yet mentioned Arceus, it will come step by step later. Pokemon movie thread in 2ch has the following new info for movie 12 and etc based on leaked Corocoro's January magazine today. Game 'Pokemon Mystery Dungeon' new series will be released. Detailed will announced in Corocoro's February magazine. Banpresto will release the following game prize plush. Same as this type. Will upload the photo later. 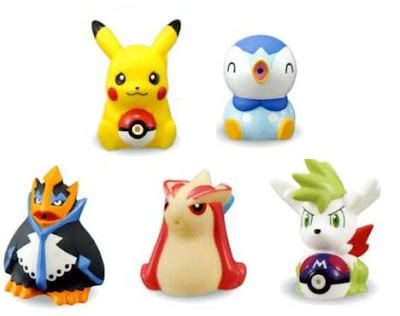 Kyoudo will release 8 figures, Pokemon metal figure collection DP7 in the middle of March 2009. Size is 0.7", Gashapon (capsule toy). A figure has 5 color variation. (gold, dark gold, silver, gunmetal gray and copper) As for previous lines, please refer to Pokemon Metal Figure Collection DP1 to DP4, DP5 and DP6. Just short notifications, multiple article. Photos for Bandai Super Get Platinum World 02 (November) and 03 (December) are uploading. Frost and Heat Rotom will come in 03. Photos for Kyoudo Metal Figure Collection DP6 is uploading. Yujin 3D Pokedex Series (Zukan) DP10 : it was postponed to end of January 2009 unfortunately. Bandai will release the following 12 figures in the end of February 2009. Size is 1.9 "-2.7", candy toys, dynamic pose. Will upload the photo later. If want to check previous Clipping figures, please refer to part 1, part 2, part 3 and part4. Bandai releases Pokemon bath Powder (solid type) DP 6 in the end of November. Bath powder contains a figure. A figure has key holder. This series has been started since 2006. 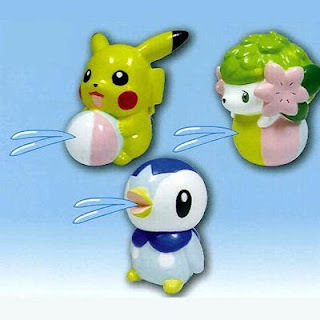 Bandai will release Pokemon Squirt Gun DP2 in the end of December 2008. Candy toys. This series has been started since 2001. Ensky will release Pokemon Squirt Gun in the beginning of February. Candy toys. 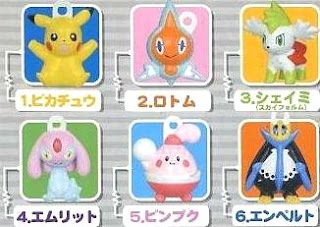 Tomy will release the following Pokemon Relax Pose (lie down pose) plush on 22 January 2009. 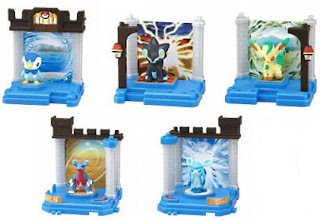 Previously Leafeon, Glaceon, Pikachu, Piplup and Shaymin (sky) are released. We can see seems look Arceus in the following video file around 0:11. It aired Pokemon TV animation for movie 12th trailer on 4 December 2008. # Why Dialga, Palkia and Giratina attack to Arceus ??? Todays's Pokemon TV animation in Japan had movie 12 info, veiled new Pokemon aired (hidden by question mark). We can see black cockscomb or wing something like that in the following pics. Seems one of baby Pokemon. It is an electric type, yellow color and important position in the movie 12th according to movie director Kunihiko YUYAMA comment. The movie title will be announced on 13 December. Thanks for the pics to 2ch Pokemon thread. Bandai will release Pokemon Joint Palace in the end of December. It is candy toys and includes a figure, can be jointed to each palace, height : 6.5 cm.